The fifth „Mokykla“ exhibition was organized on the 6th-7th of November. 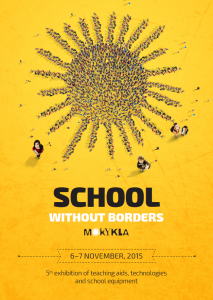 The concept SCHOOL WITHOUT BORDERS that was introduced 2014 for the first time proved to be successful. SCHOOL WITHOUT BORDERS symbolises a school in which every single community member, his/her creativity, opinion and initiatives are valued. The main highlights: STEAM education – visitors had a chance to learn about the teaching aids and best practices of STEAM (Science, Technology, Engineering, Arts, Mathematics); Generation Z – consultations and seminars were aimed to help teachers and parents to gain better understanding of this generation; Prestige of teacher’s profession – consultations were offered to those who are choosing or have chosen this profession. „Discovery labaratories“ – integrated master lessons for students and teachers were held at the exhibition. Science Centre AHHAA came with spectacular science theatre shows, master lessons and science introduction to everyone. Conference „Parents – education partners and power of change“ was held for parents. Conference on STEAM education was held for school leaders, administration, politicians, scientists and businessman. Teachers were invited to participate in dancing contest to win a trip to Science Centre AHHAA.